Perfectly safe and we’re told the fliers enjoy the work with about 250 workers utility company employees qualified to do it. 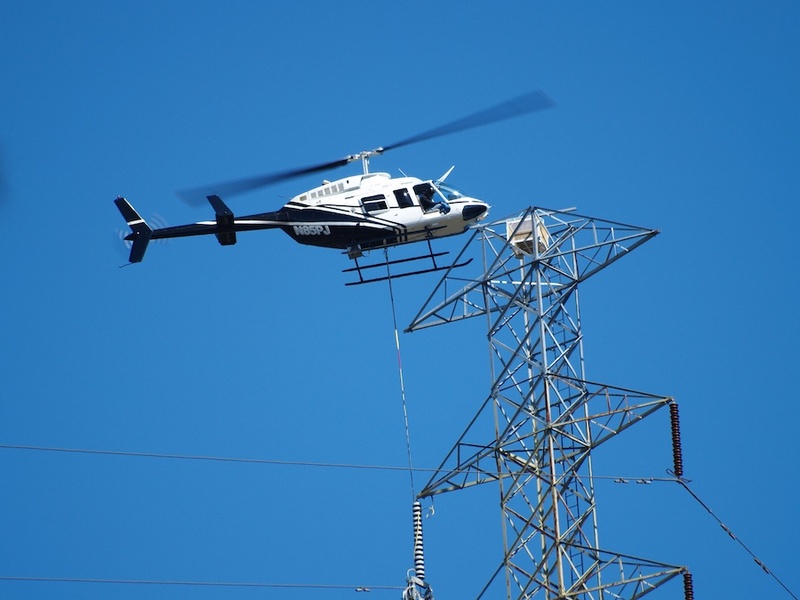 They don’t just send any old person up there, either, and the chopper pilots are especially skilled, maneuvering into hair-raising proximity of energized power lines with a supervising “shot caller” on the ground advising pilots of changes in wind or obstructions. Local Paul Ashby got close enough to the operation to appreciate the skill and nerve of the crews involved and took a few pictures along the way. Work is expected to continue for another couple of months and using the choppers, PG&E says, is easier than bringing in ground trucks. Anyone care to give it a try? Apparently you need to have ice water in your veins. No more helicopters for me thanks. Kudos to the guys who do this though. That takes real skill and nerves of steel. You wouldn’t get me up there no way. I get all sweaty when my bride asks me to get a can of something down from the top shelf. Watched them from a neighbors house yesterday. I wouldn’t do this. I’d be as nervous as a cat on I-5. Thank you to the guys who are willing to do this. I live in Moraga and have seen 4 helis simultaneously criss-crossing the sky in very tight airspace – and with alarming proximity to each other. 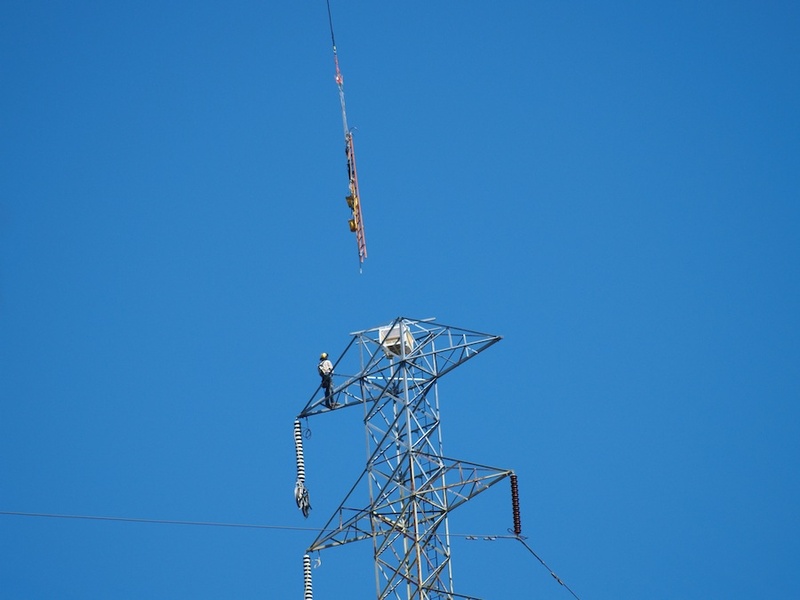 Notwithstanding PG&E’s assurances that their pilots are highly-skilled, this aerial cat’s cradle looks horribly dangerous and clearly poses a risk to pilots, tower workers and, not least of all, those of us stuck living beneath this possible disaster. There’s also the near-defeafening noise, which echoes in Moraga’s canyons and makes the 4 helis sound more like 8. After 10 hours of being blasted (they worked from 7 to 5 last week), I felt shell-shocked. Using fewer helicopters would certainly extend the duration of the upgrade, but such an approach would be much safer and have much less noise impact on those of us who now feel we’re in the audio equivalent of a war zone. (I’d like to know who the hell gave PG&E a pass on noise abatement laws.) PG&E needs to rethink this plan STAT. After San Bruno, we have no reason to trust their “no problem” assurances any more. Yes….. I’m hearing that the novelty has worn off the PGE eggbeaters and now they’re just noisy!! Do you know where they are going next?